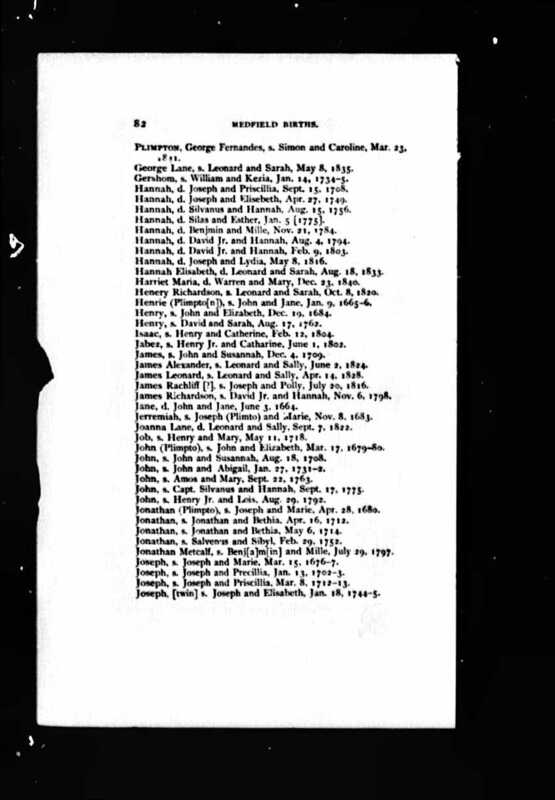 "[PLIMPTON] John, s. John and Susannah, Aug. 18, 1708"
Vital Records of Medfield, Massachusetts to the Year 1850 (Boston, Mass. : New England Historic Genealogical Society, 1903), Births, page 82, John Plimpton, born 1708, entry. John Plimpton (1708-1756) was the first child of John and Susanna (Draper) Plimpton of Medfield, Massachusetts. He married Abigail Fisher (1711-1785) on 3 May 1731 in Medfield.